I have had this image from One Kings Lane saved for ages. I love every.single.thing about this. I want our Master Bathroom to feel like this one. But I think we can aim for the "feeling" of this space. And I'll keep hoping that someday I have a clawfoot tub and a beach view out the window!! But so you can really appreciate the "after" that will happen on the 6th Thursday of this event here are a few sad and scary "befores:"
I rolled up the rug weeks ago because... I can't remember why. Bamboo blinds found on sale. Paint. Drop cloth. Ready to go. That pile has been there a while. Sadly not ORC related. Just waiting. Faux bamboo china cabinet turned linen closet. It's dingy yellow-y cream but I have colorful plans for this gem. to get the smell out but it worked!! Whaaat?? You don't store your bamboo mirrors and homeless art in your garden tub?? And speaking of garden tubs - I hope this trend never comes back around. Oy!! The 80's called and wants their tub back! Ok, that's enough scary for now even if it is Halloween month! Follow on Instagram between posts!! Or if you are looking for something less scary check out my past ORC's. I think we keep getting better at it!! The Black is Back Library ORC from Spring 2016! The Mother-Daughter Chinoiserie Meets Boho Chic Bathroom from Fall 2015! And my first ORC, The Guest Room with a British Colonial/West Indies vibe! Oh Marci I love your inspiration and of course the coral! WOW, the faux bamboo china cabinet is STUNNING! 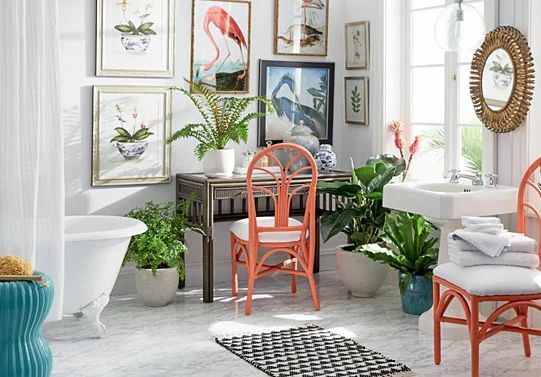 You have some great pieces to work with to make this master bath look fab! Let's do this! Thank you !!! That cabinet was the deal of the century!! :) I'll try to be worthy! Your plans are exciting. Coral and green make for a beautiful tropical West Indies look. It's going to be great. Thank you. I'm looking forward to any improvement in that space!! Ha! Your bathroom before pics look like my hallway did before I cleared things out for the painters! Now I'm wondering where to put all my junk, since we have zero climate controlled storage. LOVE that bamboo China cab. It will be fun to see the afters! I hear you!! I'm trying to "purge" not just "shift" my stuff/junk but somehow more shoving into small openings and closing the door actually happens than junk leaving the house headed for a donation spot!! Good luck! Have You Ever Noticed How You Don't Notice?